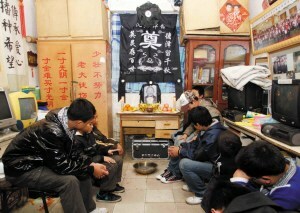 A group of children mourn in front of the portrait of their deceased adoptive father, pondering life without the man who saved 400 children from the streets. Zheng Chengzhen died from pulmonary heart disease and organ failure at a hospital in Jinan, East China's Shandong province early on the morning of November 14. He was 63. Scores of people paid tribute at his simple memorial service to a man who gave his life to rescuing waifs and strays from his local area. Most showed concern for his current nine children, aged from six to 15, who were deprived of their father figure overnight. "The children will be sent to the city's shelter center. The accommodation will not be a problem as we have arranged three nurses to look after them," said an official with the city's civil bureau. "They will not pay a penny for education as before. And a special car will pick them up for school." However, the children's future is still not guaranteed, as the shelter center only provides temporary accommodation for the orphans. For more than 20 years, Zheng has been taking care of street children who had ran away or been abandoned by their families. He helped raise more than 400 children without any returning to the streets.